There are many technical terms in renal medicine. A patient has to learn a number of these to obtain an adequate understanding of his treatment. 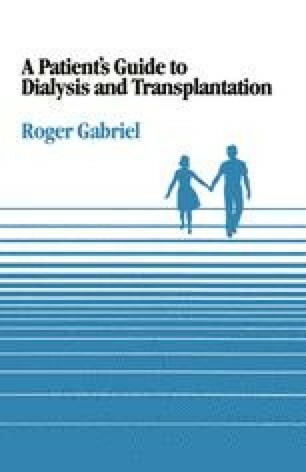 Since the majority of kidney treatments are performed by patients in their own homes a good grasp of technical terms is essential. This chapter defines the terms used in this book. It is intended for reference when reading other chapters. In addition each technical term in the book is defined in the chapter where it is first used. To understand a particular term it may be necessary to look up the meaning of other terms because some definitions rely upon understanding the meanings of others.